Lyonesse is now LIVE! Kickstarter backers should have already received their login information via e-mail. If you haven’t gotten yours, check your spam folder. We have 23 stories live in our back catalog at the moment, all available in EPUB, MOBI, and PDF format – or readable for subscribers straight from the web site itself. Our first new story, The Dreaming Wounds by Anya Ow, will go out later this afternoon. Base subscriptions start at only $6.99 per year, so don’t wait – get yours today! On Friday evening, Morgon and I got a rare date night. 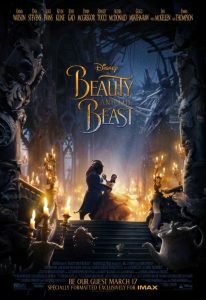 We dropped the kids off, grabbed a quick bite to eat, and then dashed off to the theater to catch the new live action Beauty and the Beast. Now, I should start by noting that the 1991 animated film is a favorite of both myself and my wife. We’ve seen it many, many times. It’s enough of a favorite that on our honeymoon at Disney World, we shelled out for our own wedding gift to ourselves – a numbered, limited edition painting depicting the title characters. Not a print, mind you – hand painted, and priced accordingly. It’s one of the centerpieces of our living room, and has been for nearly ten years. Our kids are huge fans, also. Indeed, they’ve watched the animated film at least four times this last weekend. There’s a bit of a personal connection, you see. My wife is an introverted bookworm, noted for being rather odd. And it only takes one look at my hairy self to recognize the connection to the Beast. Morgon has awaited the new film with breathless anticipation. I, however, have been less enthused. I loved what they did with Cinderella. But the trailers haven’t moved me. Part of it is because they made a conscious choice with the first trailer to mimic the original animated trailer – shot for shot. In one sense, it’s pretty cool. But the trailers in general have left me fearful that the film would hew too close to the original, failing to stand on its own legs. That first teaser didn’t help. Thankfully, the film we actually got doesn’t suffer from that problem. To be sure, it hews very closely to the original. And for the first thirty minutes or so, I still feared that it wouldn’t find its own voice. But that mostly stemmed from the one major problem the film does have: an extremely weak female lead. Emma Watson is not an untalented actress. She is also, however, simply not one of her generation’s great acting talents. Furthermore, her singing… well, it actually is rather untalented. Even I could hear the autotuning in effect, and I’m usually the guy missing it when everyone complains about it. Her voice just doesn’t live up to the rest of the cast’s. As if that wasn’t enough, they made too many subtle changes to the character. Belle in the animated film is unfailingly kind – even when she has every reason not to be. It’s a deep part of her character. This Belle, however, is downright rude. She isn’t merely withdrawn and odd, she stands aloof over the village peasants. I find it hard to sympathize with her because she treats them so poorly. No wonder they dislike her. But the biggest issue is her interactions with Gaston. Now, I love this version of Gaston. They toned down the cartoon buffoonery – especially early in the film. He’s a far more likable character. In fact, one can easily see why the entire village loves him. Yes, he’s still a bit of an oaf. He’s still a bit hung up on himself. But in this version, he’s portrayed as a man trying to gather up his courage. He is, after all, about to propose to the most beautiful girl in the village. Even his famous pub song is portrayed more as his friends trying to put him back together again. It works wonderfully. Except for the fact that Belle is exceptionally rude to him, when this version of Gaston hasn’t quite earned it. Yes, perhaps, she’s right to actually turn him down. Certainly she’s within her rights to. But she doesn’t just turn him down, she beats him down, hard. Her reaction is over the top. The film relies on our recollection of the annoying Gaston from the animated film to make us dislike him. It’s a shame, because they improved his character arc in every way. What’s most interesting is that this almost works in completely the opposite way as intended. It gives the character of Belle a bit of a character arc that’s missing in the animated film. Yet because of its accidental nature, it never quite seals the deal. Still, everything else about this film is top notch. Have I mentioned Gaston yet? He steals the show. The Beast himself puts on a good act, too, however. Everything you’ve heard about La Fou’s gay character changes? It’s actually good. It’s funny. Riotously funny. The backstory of Belle’s parents is a nice touch, as are several other subtle additions: the perpetual winter surrounding the castle, the forgetful nature of the spell, Maurice’s imprisonment being due to theft rather than mere anger. The touches of period setting, costumes, and props added back in – such as Gaston’s crossbow becoming a pistol – are wonderful. This could have been a five star film. It should have been a five star film. In the end, however, Emma Watson’s Belle hurts. The best I can give this film is four stars. Lyonesse is very nearly ready. We’re formatting the launch content and uploading it into the system now. Next, we’ll be entering all of our Kickstarter backers into the database and enabling their subscriptions. And that’s it. At this point, the process is going very smoothly. The official Lyonesse launch date will be Tuesday, March 21, 2017. We’ll be going live somewhere around 8:00 AM Central Time. I’ll have to punch the button manually, so that’s about as precise as I can time it. For those of you who ordered t-shirts, they will be coming soon. Stay tuned! As a few people have noted to me privately, Lyonesse is supposed to be going live soon. Since we haven’t had an update in a while, it’s time to fill everyone in. The TL;DR version is that it’s almost ready to go. I held off on this announcement a bit because I really wanted it to read: “Lyonesse is live!” or, at the very least, “Lyonesse is going live on X date!” And it’s pretty close. It’s just not quite there yet. I was hoping to have it all operating this weekend. Obviously, that hasn’t happened. The front end is about 95% done. Basically, I have a few minor but important pages to put some finishing touches on and I have to actually finalize which stock images I want to use, pay for the real ones, and replace the watermarked ones I’ve been using for testing. Pretty easy stuff. The tougher part, and the reason that’s not done yet, is because I had to completely change the design for the back end. My original plan had been to go with a paid monthly service I found that seemed to pretty much handle everything exactly the way I wanted to for delivering subscription based digital content. Then I got a trial account. I started development. And… I found the service quite lacking. On the content delivery side, it does handle all of that well. On the customer account management side, however, it basically does nothing. There’s no way for customers to manage their accounts, cancel online, see their history, etc. There wasn’t even a way to integrate a “my account” page into the Lyonesse web site. This was completely unacceptable to me. We’re running a small operation, and we probably won’t have everything perfect right out of the gate. But the user experience needs to be better than that. So I had to find an alternate technical solution, and that took some time. Then I had to rip out everything I’d done and basically start it over from scratch. That also took some time. I have decided on an alternate solution, I’ve spent a lot of time working with it. So far, it’s looking great. I have a few more things to test with it to verify that it will actually do everything we need, but so far it’s looking very good. If everything goes well, we should be up and running within a week. If we have a few more minor hiccups, that might stretch to two weeks. But barring another major disaster, that should be about it. All in all, we won’t be too far off schedule. I’ve already had a handful of people report back to me that they’d rather see it a few weeks late and right than see it now but with major problems. I wholeheartedly agree. The silver lining in all of this is that the site has ended up being far superior to what I initially envisioned. I’m really quite happy with how it’s shaping up, and I hope very much that all of you will be as well. Lyonesse backers and fans, bear with us just a little bit longer. It is very nearly ready!